Leave the old flooring down while you are doing the demo and painting the interior, especially if you will be refinishing floors or doing a lot of drywall repair. Once you have your plan, order all the materials. If something is back-ordered, pick something else. It will throw out the whole schedule if critical items do not arrive on time. Overall Interior Colour Scheme: Pick a theme that you like and stick with it. Then you can use it again on the next property. It comes in handy if you need to pop back and do some paint touch ups, replace tiles, carpet patches etc. (Especially Rentals). Select the elements that are harder to find first; specialty items (e.g. Tile for fireplace surrounds, unique backsplash tiles, matching existing stained glass or other elements that you cannot change). 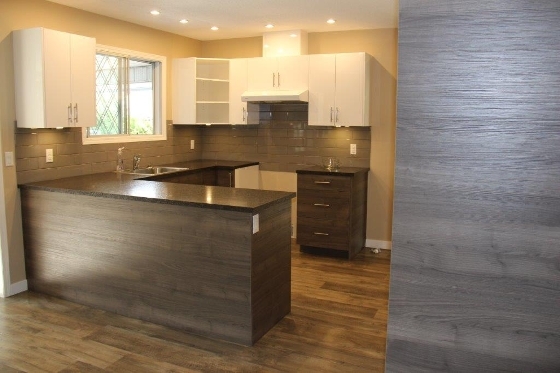 Then pick the next item, usually flooring or floor tile, then carpet, then hardware and plumbing fixtures, then paint colours, then staging items. Electrical Plugs and Switches: Unless a period home, use Decora updated plugs and switches. It's not that expensive and really updates the look. Use white, not a specialty colour. Do the cable outlet and telephone outlets too. 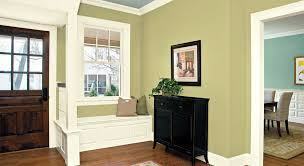 Interior Doors: You can use the same paint on the interior doors that you use on the trim. Update the hardware, ideally levered handles rather than knobs (unless period architecture). 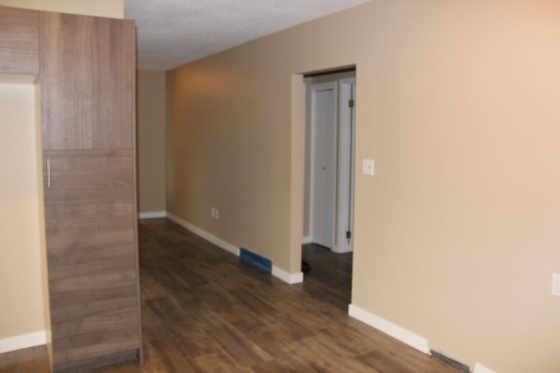 I am not a fan of the builder special 6 panel door with wood grain. I would rather use a more cost-effective slab door, even with wood grain painted to match the trim, or in certain cases stained, and great hardware. 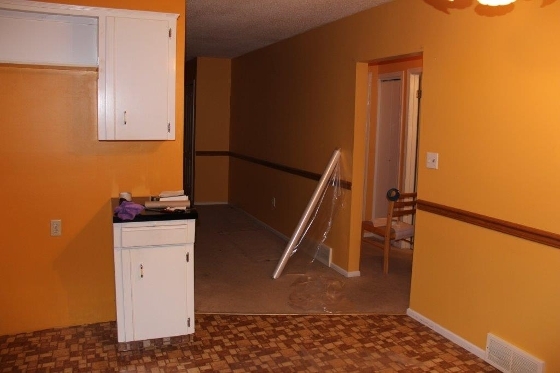 C-How many coats of paint are on those old doors? Not closing properly? Time to strip? Closets: Use opening doors and bi-pass sliders if possible. In a more generic property, use obscure glass for a bit of wow factor for closet doors, mirrored doors are out-of-date in my opinion unless they are panelled rather than frameless. I like to use the wired white or platinum coloured shelves that allow the hangers to slide along the rod. Do double hanging; the cost of the extra shelf is minimal and it sets your place apart and doubles the hanging capacity for very little extra money. If budget requires bi-fold doors, use good hardware to ensure that they are easy to open and close and don't fall off the rail. Fit them square and level, use good knobs (easy to grab) paint them to match the trim colour in the same semi-gloss finish. Make sure you take the height of the carpet into account when fitting; you're often fitting the doors before the new carpet goes in. Flooring: C-Hard surface flooring is popular and practical. For uneven floors that won’t take a rigid plank, self leveling compound may work in certain situations, but a lot of work. Armstrong Vynil planks are one option, an amazing wood like finish and are super durable. On this project, the old floor the 60’s lino likely contained asbestos. Removal was unthinkable in terms of time and cost. Plus there was a hump in the middle of the room and 7/8” drop from kitchen to adjoining living room. We decided to sheet the LR with 5/8” plywood, fan out the difference from the seam, apply a thin coat to the lino in kitchen and laundry room and then used Armstrong Vynil planks to cover kitchen, laundry and LR with one continuous floor. Vynil planks need to be sealed after install. 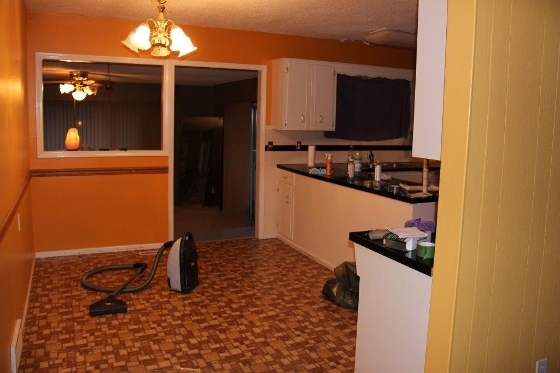 Total cost, about $8 Sq Ft.
amount, pick the carpet colour, then the paint colours. If you can, refinish existing wood floors. - often a bonus find - when viewing the house carefully lift a corner of the carpet or remove the heating vent cover to see if you have wood floors. Oak and fir floors are very popular in Victoria. Wood look laminate can be very good now; flat finish or low satin sheen is best. If it looks cheap don’t buy it. C-If there are pets, I like dense low pile single strand carpets. Cats will damage and pull closed loop carpet with their claws. Stand back from your samples -look at the carpet/laminate/tile from a distance to see the real colours. Too many people choose materials up close and don't see the overall colour tone until the product is laid. Original concept by Denise Andison C.K.D./C.B.D. Co-founder Victoria Real Estate Investment Club. Started flipping homes in 2004 and has remodeled multiple properties for flipping or holding since then. CliffNotes added by Cliff Wettlaufer, Victoria Real Estate Agent and passionate Renovator. Thank you for sharing Denise!